I’ve mostly been hiking with a sketchbook lately, but I did take my camera on one hike, to Lukens Lake in Yosemite. It was a drizzly overcast day and I really just picked Lukens Lake because it’s only a mile from the road and I’d never hiked to it before, but it turned out to be a great destination (surprise, surprise, a great spot in Yosemite NP, right? 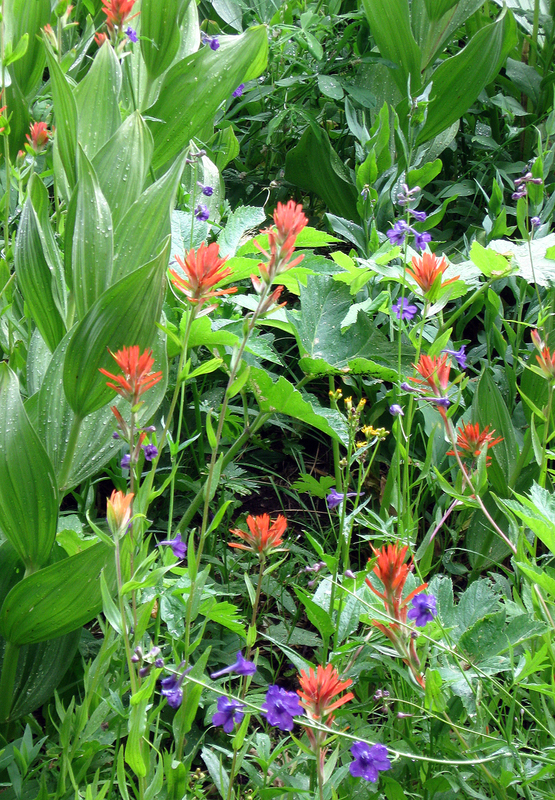 ), with some of the best wildflowers patches I’ve ever seen. I counted two dozen different species blooming in about a one hundred yard radius. The mix is similar what I saw at Agnew Meadows a couple of years ago. 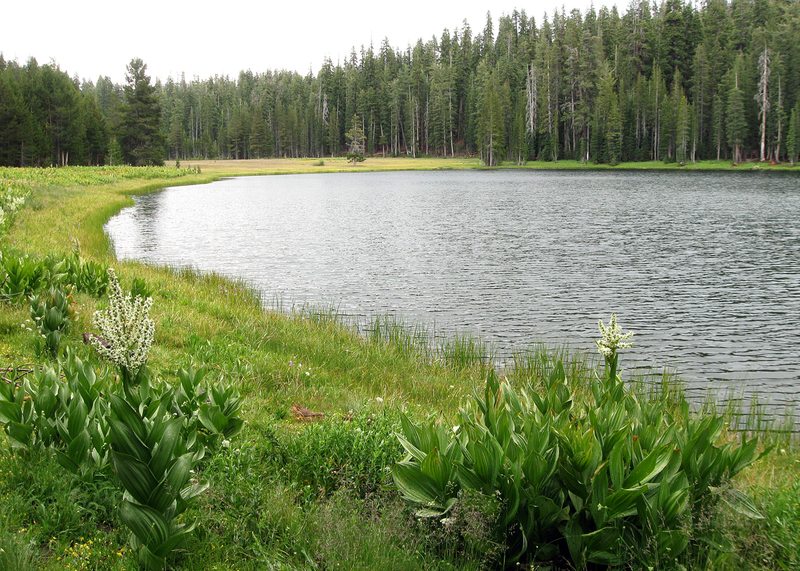 Both spots are upper montane forest at similar elevations (8,100 feet for Agnew Meadows, 8,200 feet for Lukens Lake) and they might be less than a hundred miles apart as the crow flies, though Lukens Lake is on the west slope of the Sierras, Agnew Meadows on the east. 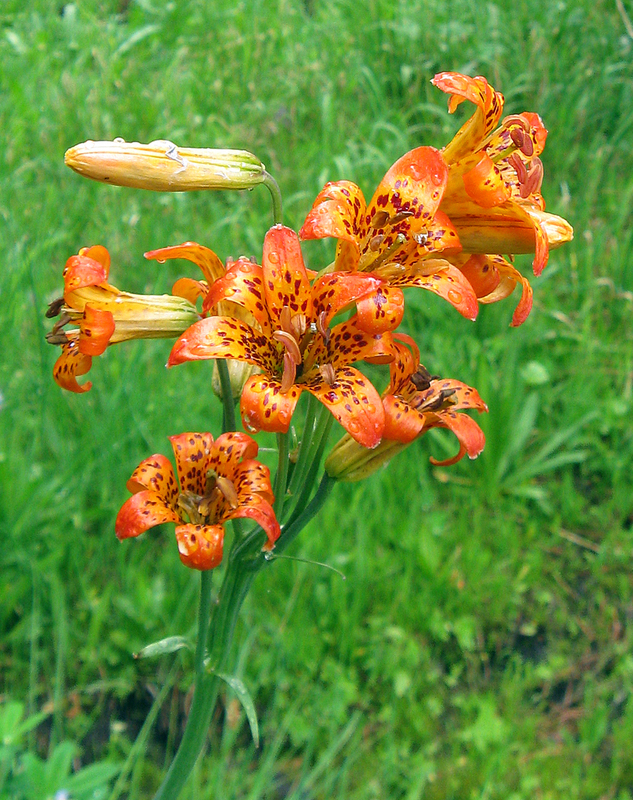 Agnew Meadows has the bigger Lily, L. kelleyanum, compared to Small Tiger Lily, L. parvum, at Lukens, but otherwise many of the plants were the same. Small Tiger Lily is, like the name says, one of the smaller lilies out there, but there’s still something about these flowers that always stops me in my tracks. They’re not much bigger or showier than Western Columbine, but they make the whole space feel like a garden. 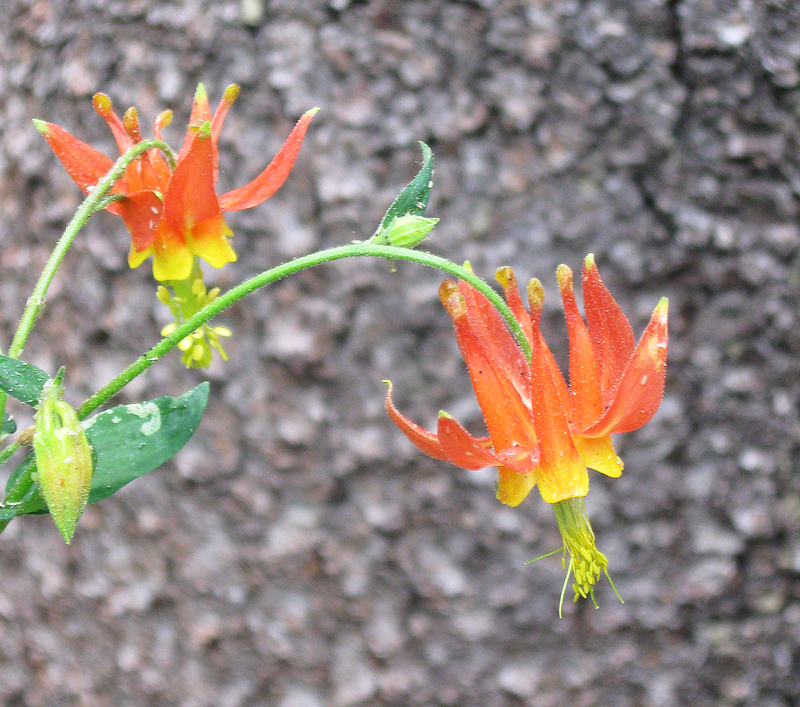 Though Columbines are also pretty great. Corn Lily was the dominant plant visually. I’m really starting to appreciate them, for the flowers but also the way the other wildflowers are set off against their leaves. 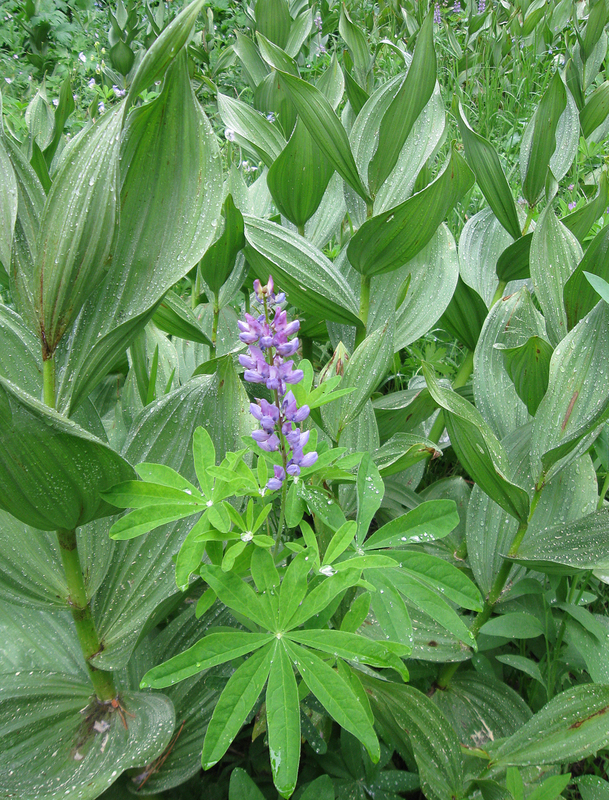 Lots of purple from Lupine but also Monk’s Hood (above) and Larkspur mixed in with the Indian Paintbrush (below). And quite a few other flowers, including tons of this Aster, which I’ve never identified despite the fact that it’s so widespread. Kind of like LBB and LGB (Little Gray Bird, Little Brown Bird) and the horticultural equivalent DYC (Damned Yellow Composite) which I learned from Town Mouse, I just think of these as SKA — Some Kind of Aster. I also saw a pink flower that I don’t know; it might have been a version of Owl’s Clover. 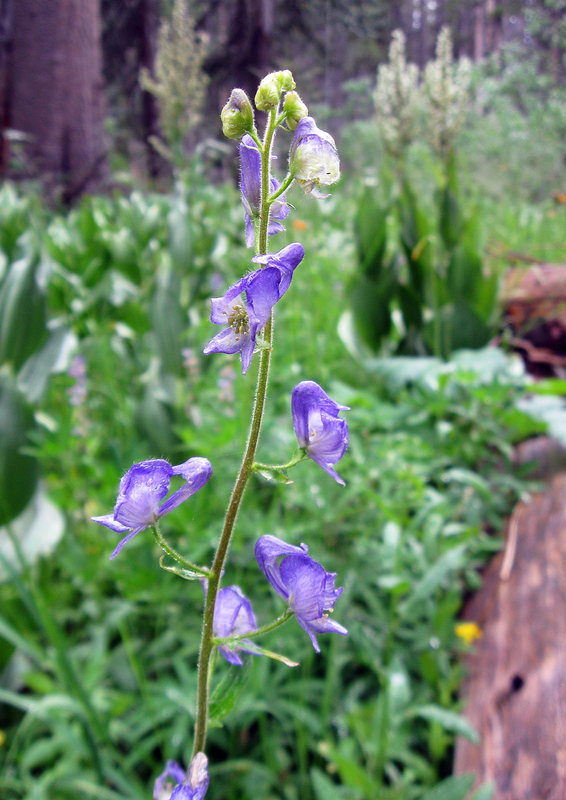 Other flowers included Meadow Rue, Monkey Flower, Viola, Angelica, Senecio, Mariposa Lily just outside of the meadows, and more. A great place to see wildflowers in July. 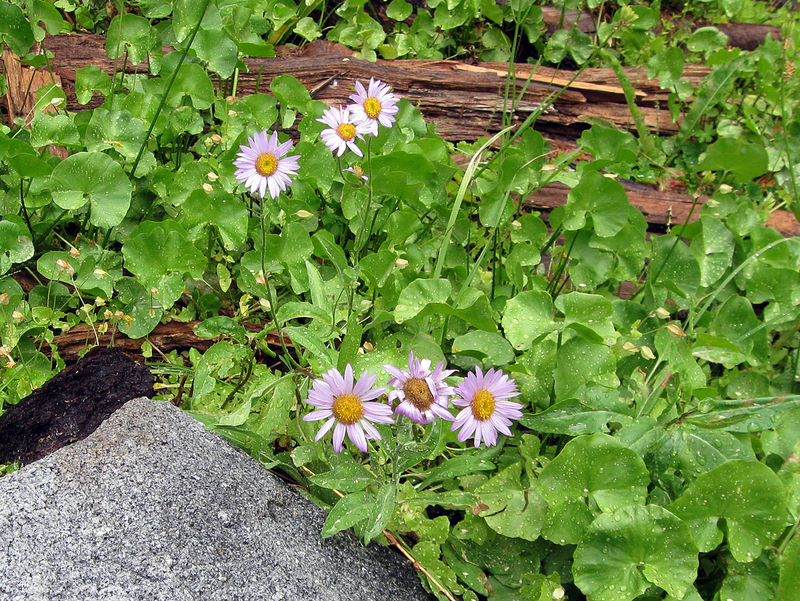 This entry was posted on Sunday, August 12th, 2012 at 1:34 pm and is filed under california natives, plants, wildflowers. You can follow any responses to this entry through the RSS 2.0 feed. You can leave a response, or trackback from your own site. 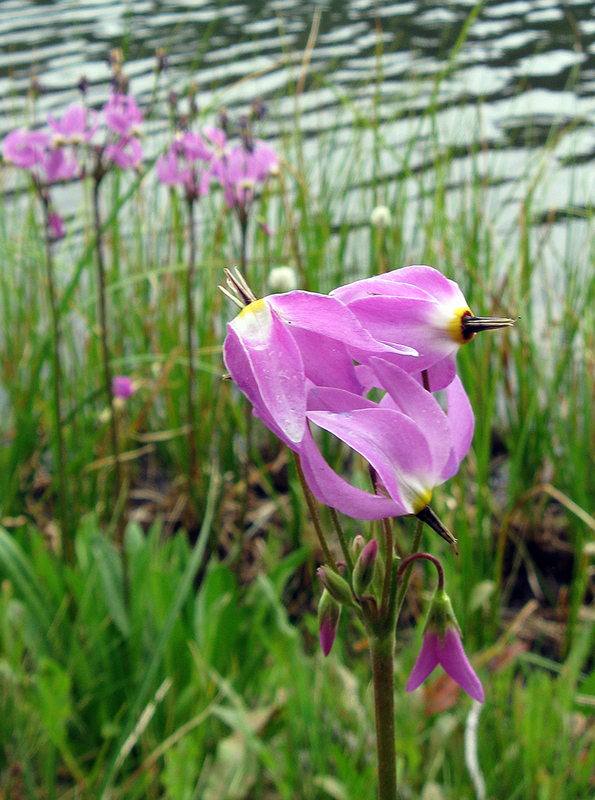 These look like most of the same plants that I saw a few years ago at Snake Lake (near Quincy, CA). It was the most beautiful assortment of different flowers I’ve ever seen in the wild. Ah, those photos do bring back memories. 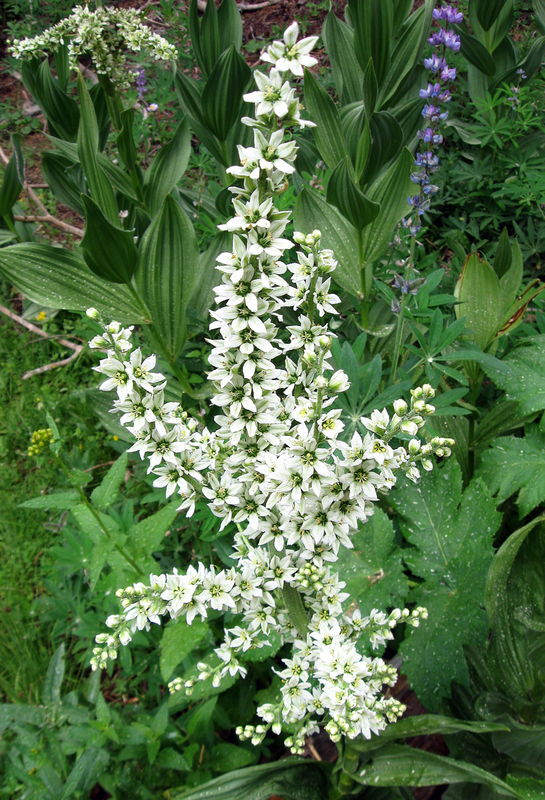 The corn lilies are really something – I would love such large leaves in my garden in the summer. BTW, those sketches in your last post, what did you use? Watercolor pencil & ink? I can’t figure it out, but it looked great! Gayle, I don’t know Snake Lake, but maybe I should check it out. I’ve only been up to that area once and only for a brief time, but it seemed great, and I would love it if they have more wildflowers like these. Town Mouse, I did the sketches with ink and a little pencil up there, then I colored them at home using photoshop, trying to get the computer color to look like marker put on the back of vellum. I think I lose a lot of cred from the sketchworld for coloring at home on the computer, but I wanted to practice the technique for when I do landscape graphics. Wow lovely pictures. I wish I had a place like this down the road from me. If I want to find real wild flowers I have to head north in to the highlands of Scotland. Worth the trip though as I am sure you’ll agree.